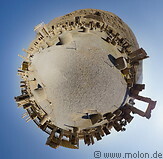 A number of structures were located inside Persepolis. The major one was the Apadana, or Palace of Xerxes, a large palace with the shape of a 60m x 60m square. The interior of the Apadana contained 72 columns with bull sculptures on its tops. Inside the Apadana ruins are many well preserved bas-reliefs. The second largest structure was the 100 columns palace, also known as the Throne hall or Imperial Army's hall of honour. It served as a reception hall for army commanders and delegates of the Persian empire. Other palaces are the Artaxerxes palace and the Palace of Darius, which is relatively well preserved.